Often the bride and groom complain that their photographer had little experience. The couples felt awkward, and the images looked horrible. Horrible like in "a 14-year-old with an iPhone could take a better picture" to quote a couple. But wait! It gets better: to compensate for that, his wedding packages include everything: unlimited photos on your big day, engagement photo shoot and even a wedding album and a second shooter. By the way, your engagement session is a great chance for the newbie to learn his camera. Here is the truth: their second shooters never photographed a wedding and Voila! You have your recipe for disaster. Weddings are unpredictable events and your photographer should be a quick problem solver. That is if he knows what he's doing. With no experience, let's hope his plan B is "I hope it doesn't rain." Cheap photographers go bankrupt every day. Why? The costs of running a business in Toronto are simply too high. Now, you might be wondering: how can they survive charging peanuts? Well, they are part-timers! 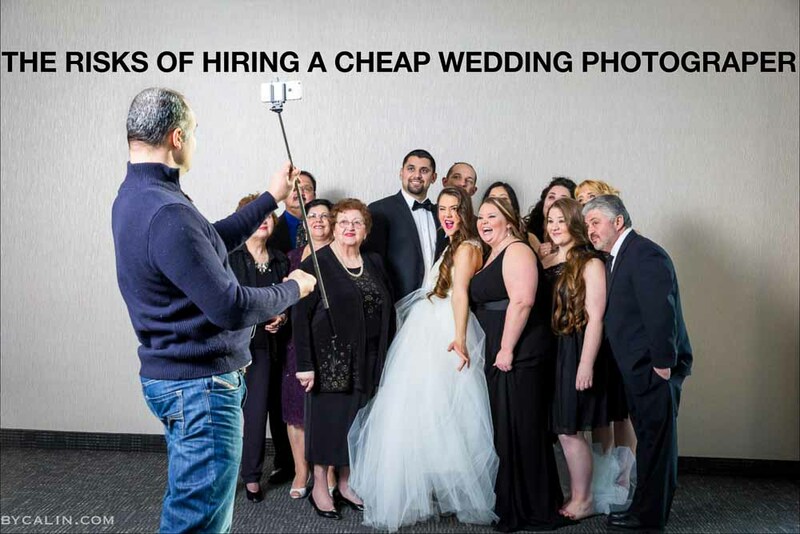 They have no reputation to uphold and take forever to deliver your wedding photos. Also, they can not spend much time on your images. As a result, they will slap some cheap filters over your wedding photos and call them fine art. Even worse, in extreme cases, the photographers don't even process the pictures. Buyer beware! It gets worse: they will slap some cheap filters over your wedding photos and call them fine art. You know what's the best part? Many photographers don't even process your pictures because they don't know how. An inexpensive wedding photographer has no website, and you can not give him reviews. Sadly, I know cases when such people cancel last minute or worse, never show up at the wedding. That is when brides call me desperate to find a professional! I get it! I really do. Every human is looking for great deals. Still, in this case, it is more important to have a professional capture your wedding day than save a few pennies. Now, this is crazy: many photographers cancel last minute or worse, they simply don't show up on your big day. That is when couples call me! Because he has a full-time job non-photography related, the cheap wedding photographer takes 3-4 days to answer to your email. That is crazy! What do you do when you have to ask a question a few days before your special day? Imagine you need to call Mr. Cheap Wedding Photographer the day before the wedding to tell him your last minute changes. Forget about it! Poor customer service is the norm for such "pros". On the other hand, my turnaround average is 4-5 hours. Moreover, I always return my calls within 1- 2 hours unless I am shooting your wedding. After all, you don’t want me on the phone when your grandmother is shedding a tear! I get it! I really do. After all, I do my best to offer you affordable wedding photography and I have a budget for my purchases! Trust me! It is more important to have a professional capture your wedding day than save a few pennies. I wish you best of luck finding the amazing photographer for you.